A longtime tradition for families visiting the Disney parks is watching the elaborate parades, with the dancers, acrobats, music and floats - it's no wonder that guests line the parade routes to claim their best viewing spot far before any parade begins. 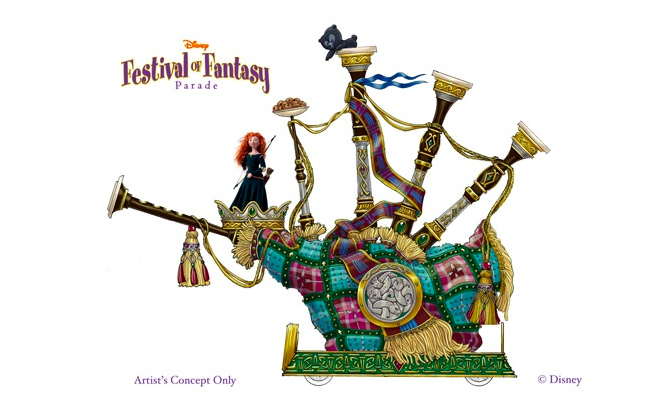 Disney Parks Blog has just released an sneak peek glance into the newest daytime parade set to debut at the Magic Kingdom in Spring 2014, called "Disney Festival of Fantasy Parade". The parade features many beloved characters, but the one float that we are most excited about would be the addition of the newest Disney Princess, Merida. An entire Brave themed float will be rolling down Main Street U.S.A with a troupe of Scottish dancers, music and of course Merida's pesky little brothers (in bear form). We are thrilled to have Brave showcased in a Disney parade as it is one of my favorite Pixar films. What do you think about the newest parade? Are there any Pixar feature film or Pixar short films that you would like to see showcased in a Disney parade?